Ginger's Garden Handmade Artisan Soap: Every man needs to shave. 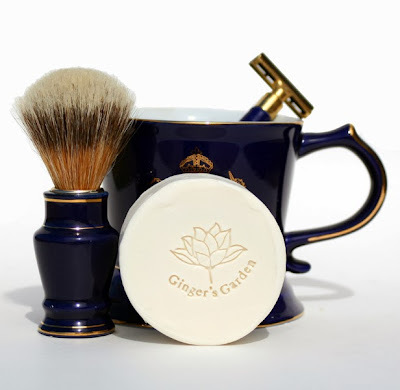 Enjoy your shave with Ginger's Garden wet shaving soap. Buy handmade soap for Christmas. Every man needs to shave. Enjoy your shave with Ginger's Garden wet shaving soap. Buy handmade soap for Christmas. Lime oil and Japanese Yuzu Grapefruit shave soap is best used with a brush and a razor. You can use this round bar directly on the face and create lather also. Wet shaving soap that's made with the cold process method has extra shea butter for moisturizing properties and natural clay for extra slip. Lime Grapefruit round shaving soap makes a wonderful gift for Christmas. Lime Yuzu Grapefruit Shaving soap is made with extra stearic acid for long lasting stable bubbles. This round bar is for classic, old fashioned shaving and is about 4.5 ozs. My handmade artisan soaps are made with olive, coconut, shea butter and castor. Makes a unique handmade soap gift for Christmas or any other occasion. Buy yours here> Ginger's Garden Wet Shaving Soap.